It is easy to miss all of the new advancements and capabilities that Veeam has recently delivered. With the release of Veeam Backup & Replication 9.5 Update 3, some of the big news is a serious advancement in the storage integrations, including the addition of Lenovo storage. In this post, we’ll discuss the new Veeam primary storage integration with Lenovo Storage V Series. What problem does this storage integration solve? Reduce stress on primary storage: The backup from storage snapshots capability will reduce the amount of time a VM has a VMware snapshot open and move data from the storage snapshot; effectively allowing you to take a backup at any part of the day AND retain Changed Block Tracking Data. You’ll have faster, less impactful backups. 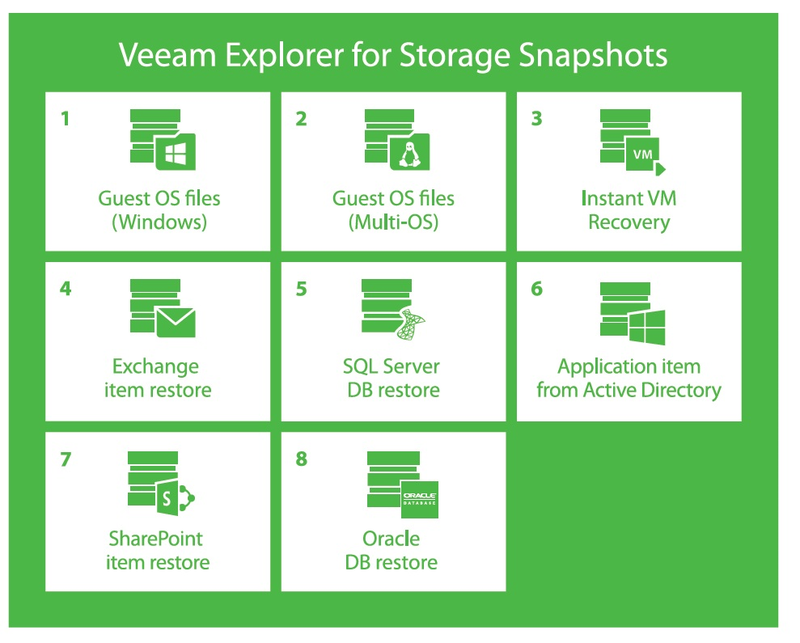 Give recovery options from a storage snapshot: The Veeam Explorer for Storage Snapshots capabilities allow you to restore data (a VM, a file or an application item) from a storage snapshot on the array. This can be done ad-hoc or via a schedule set on the array. Ensure storage snapshot copies are made: You can orchestrate the creation of storage snapshots on the Lenovo Storage V Series to ensure that you have the ability to recover when you need it. Test with confidence: Probably the most powerful capability is the virtual lab capability to run an On-Demand Sandbox from a storage snapshot. This is very powerful as the performance profile of this virtual lab function will be on-par with the product workloads and it can save you unplanned downtime on critical changes by going into a change with complete preparation and confidence knowing the outcome. The Lenovo Storage V Series provides the flexibility to start small and keep growing while leveraging existing storage investments. Now with support in Veeam Backup & Replication 9.5 Update 3, Lenovo customers can enjoy a new level of Availability with Veeam to protect data, applications and IT services. The first step is to analyze which VMs in the job are on the Lenovo Storage V system. The second step is a VMware snapshot is called to all VMs on that storage volume, which will provide the application-consistent state of these VMs. The third step is to call a storage snapshot on the Lenovo Storage V system. The fourth step is a Veeam-proprietary benefit where Veeam Backup & Replication will retrieve the VMware CBT information of the VM snapshot created in step 2. Next, the VMware snapshot is released. 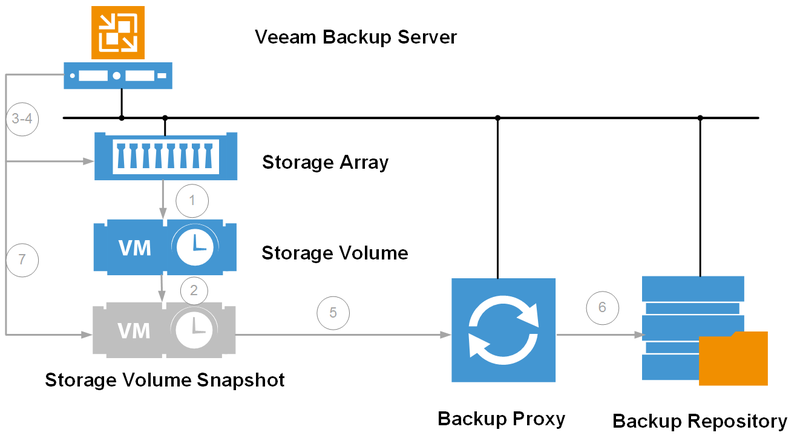 The sixth step mounts this storage snapshot which includes the application-consistent state of the VMs to the VMware backup proxies in the Veeam Backup & Replication infrastructure. The Veeam proxies then read new and changed virtual disk data directly from the storage snapshot and transfer the data to a Veeam backup file in the backup repository. The final step will remove the storage snapshot when all VMs have been backed up. This easy-to-use integration gives Lenovo Storage V customers incredible Availability options by being able to take backups with much less stress on production storage. Additionally, recovery points can be added easily simply by having a storage snapshot schedule set on the array. This integration in Veeam Backup & Replication 9.5 Update 3 is just the latest capability to provide the Availability experience that organizations demand. You can find more about Veeam and the storage integration capabilities here.